It is very easy to use the new and updated contact form of Divi. Through this post, we are going to explain you about the “Conditional Logic” option of the Divi contact form which is very simple and very helpful. Conditional logic helps to display and hide fields based on the information placed in the form. On enabling this you will get the option to apply the condition for the required field which should be fulfilled with unique input. We have applied the conditional logic in the “preferred mode of communication” field, in this field there would be two options either a phone number or the email id which will appear in the drop-down. If you will select “Phone Number” in the mode of communication then you will get the option for entering the phone number which appears as below. If you will select the option of “Email Address” then it will give the option for entering an email address which will appear as below. 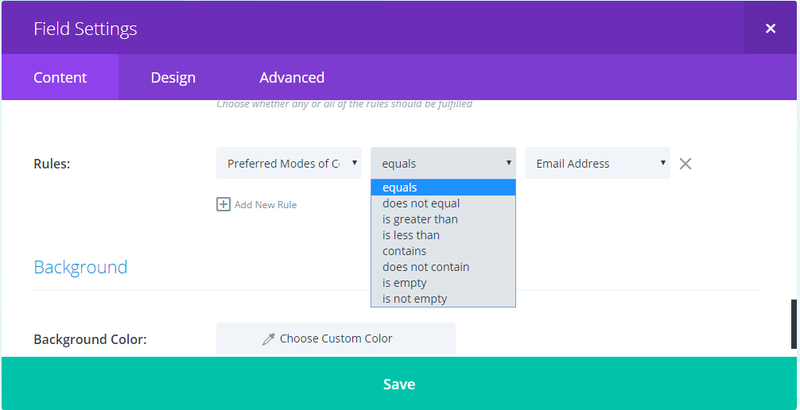 Equals – This rule matches when any entered information in the field is equal to the value you specified. Does not equal – This can be said as the opposite of the equal rule in which a field will appear when entered information does not match to the value specified. Contains – This will match when entered data contains any specific value. This is quite different from the Equal rule because it does not require any maths. Does not contains – This is opposite to contains rule which means it will display a field when the value which is entered does not match with the value specified. Is Greater Than – This option works when entered value is in numerical form. Is less than – This option is opposite to the Is Greater Than rule and appears when entered value is not equal to the specified value. Is Empty – This rule display a field when another field is empty. The conditional field will be removed once the data is entered in the field. Is Not Empty – This rule display a field if the other field has some value. Hope you would have understood the logic for implementation of the conditional logic in the Divi contact form which is the awesome feature.